Jon "Bones" Jones is still the light heavy weight champ of UFC with his TKO of Chael Sonnen. I have to give Chael a lot of respect for his sportsmanship after the fight. What is more amazing is that it appears that the champ suffered a Hallux Interphalangeal joint dislocation if not an open fracture of the Hallux Interphalangeal joint. Above shows this injury. This is NOT the Xray of Jon Jones but this is a similar injury that he sustained during his fight last night. Typically seen when a person get's their toe caught on a divot in the mat or canvas as they pivot to through a kick or establish ground control or dominance. Seen in Tae Kwon Do athletes who practice on jig saw mats, as they use a lot of spinning kicks during sparring and training. Joe Rogan said it right, "nastiest toe injury, I have ever seen." I have been called to the ER in Naples for these injuries. Some patients are able to be treated with a round of antibiotics as the bone is exposed to the air / elements now for at least two weeks with a closed reduction of the deformity with an external splint. Moderate cases may need temporary pinning with a steel wire in order to hold the joint in alignment, the pin is then removed at 6 weeks after the soft tissue heals around the injury. 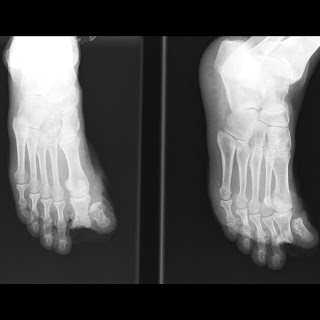 Severe cases where instability is an issue a procedure called Hallux Interphalangeal joint fusion is required. This is where the joint cartilage is taken out and the two bones are joined together to allow for stability. Fusion procedures take 6-8 wks to heal. Either way, this injury should not be a career ending injury for our Champ. Easily treated with proper clinical judgement. Bad injury on a bad dude. Jon Jones now matches the winning record of Chuck the Ice man. All round great fighter and now a fellow Gracie Barra Jujitsu Brother, osss or oos in Japanese.